You need a Browser which supports Java to see this image..
wish you a pleasent visit to our pages! Woophy's Siamese & Orientals . Credits to the photographers: Alan Robinson, Ales Movak, Nino di Molfetta, Woophy's and Jadeye. 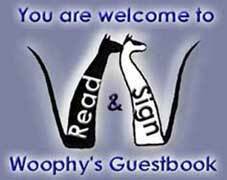 Woophy's want to thank Jadeye Cattery for designing & setting up these pages. And for being our webmaster for some time!